Remarkably, even the researchers aren't 100 percent certain how it works. Neural networks are machines and algorithms developed to behave like the human brain—but a development from Google Translate shows that (once again) AI can outperform humans in a big way. 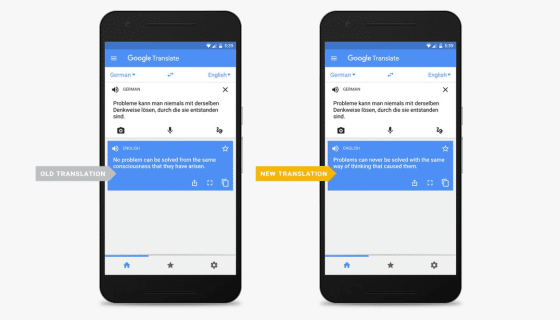 Google’s AI can now translate language pairs it has not been trained for. To be clear, this means that it can translate between languages that it wasn’t taught to translate. This works if the AI first translates both of the languages into a common language that it knows. The development is detailed in a paper published on Cornell University’s arXiv. To break this down, Google recently upgraded Translate to the company’s deep-learning Google Neural Machine Translation (GNMT) system, paving the way for a slew of improved capabilities. In a blog post, researchers from the team, which is aptly called Google Brain, discussed how this new “Zero-Shot Translation” works. In short, the system is able to automatically group sentences and phrases with the same meaning. It then links together meaning through previously-learned languages in what the developers call “interlingua”. The development not only gives users a wider range of functionality, it also cuts back on high computational costs. Translate works with 103 languages, which corresponds to 5,253 pairs that, with older computational techniques, it had to be trained for. The neural networks it now works with have models that can skip human-inputted training, thanks to advanced and complex encoding systems. A future where artificial intelligence needs barely any human prompts to function is full of possibility—both bad and good. Self-learning AI is being explored by several developers, and tomorrow’s everyday computer is expected to have these capabilities (to be able to improve its performance through its own experiences). This means that our computers will not only be able to self-train, eventually, they will know what we need and anticipate our desires without any prompting. Of course, this is a few steps removed from where we currently are; however, more and more, AI is not only becoming human-like, it is outperforming us in nearly every way. So a future disrupted by fully-autonomous AI is not all that far-fetched. These developments help to reveal that, while the machines we create decode complex networks of computation, we need to determine how to use them for the best. Today, it may be a translator’s job that is on the line, but in the future, the limits seem boundless. Editor’s Note: The title of this article has been updated for clarity.